Your portfolio is perhaps the third or fourth impression you give a prospective employer, after your resume, cover letter, and initial interview. It is the product you show an employer if they either haven’t seen any of your work samples before or they want to see more. Small confession here: it took me years to get my portfolio into the neat, tidy order I’m about to share. For much of my career, I put things in there in reverse chronological order and put the resume on top. Well, live and learn. I’ve picked up a few things. The following are suggestions, not rules. If you have ideas that work for you, I’d love to hear them. I use a conventional three-ring binder with a pocket at the front end and locks on the binder to reduce the likelihood of pages coming loose. 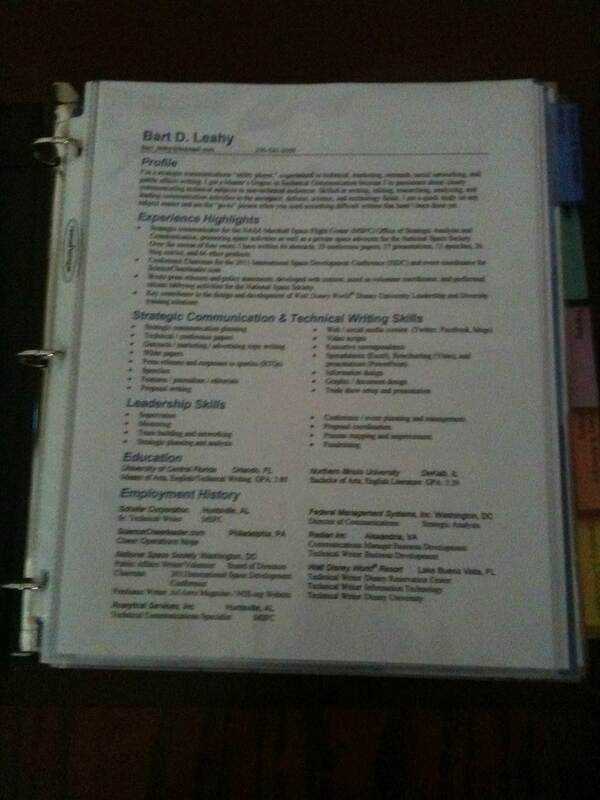 I still keep the resume up front. I’ve also created a separate “Publications” document (I might add that as a tab to this blog–we’ll see). That way I can keep my work experience content down to two pages and share publication information only if asked. Another thing I decided to do with the portfolio was not to share everything I’ve done from every part of my career. I’ve trimmed the collection down to five categories of work with the four or five best samples of each. These categories are divided by tabs. Obviously your work will be organized differently. If you’re relatively new to the field, you probably don’t need the tabs. However, it is good to include a variety of products. Or, if you’ve stuck with one type of work–say, journalism–then it’s good to show the breadth of your work across multiple topics or publications. Until I had more work products to show, I included school projects in my portfolio. 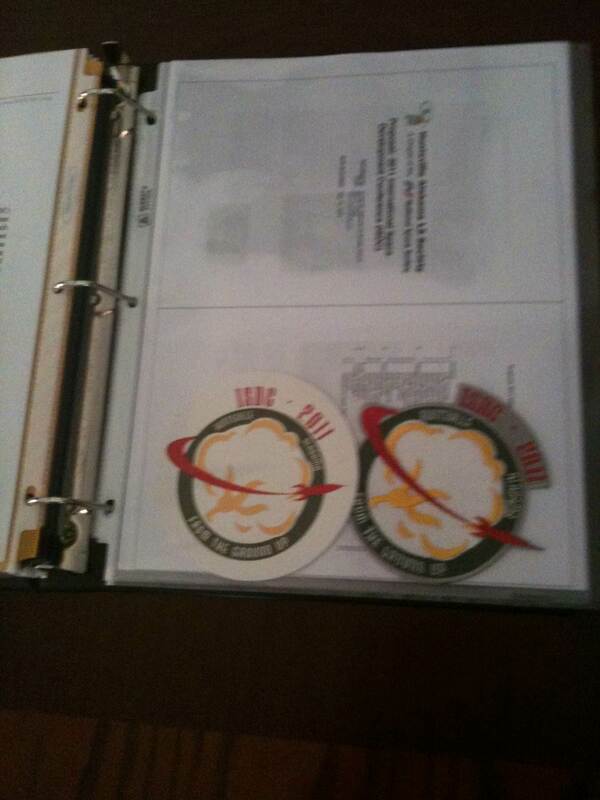 One set of products I included was the marketing material that was developed for the conference I ran. Now, did I create the artwork? No, that was my very talented designer friend Tina. However, it was my requirement to display the ISDC “brand” far and wide (another marketing lesson I learned from Disney). Tina’s fine logo was plastered on stickers, patches, letterhead, t-shirts, coffee mugs, and signage throughout the conference. Take advantage of Avery pre-printed labels or labels that you can program when setting up your category tabs. This was necessary for me because my handwriting is just this side of awful. Use the same type of sheet protectors throughout the portfolio. Proofread any work that’s in your portfolio, especially your resume. If there are typos or errors that were beyond your control, be prepared to explain them. If you have had work published in print publications, trim it so it fits neatly inside the sheet protector. If you have one or more documents that have a “landscape” orientation, be consistent in how you insert them into the sheet protectors (e.g., top facing out, away from the binder). Obviously your work doesn’t just speak for itself. You should take care to pick your best work and be able to explain why it’s in there. Like the ISDC branding example, I could explain to someone, “This is an example of how I ensured my brand was expressed across multiple products.” As with your resume, you want to be able to demonstrate products that allowed you or your company to improve. I’ll probably have more to say about resumes eventually, but this will do for now. 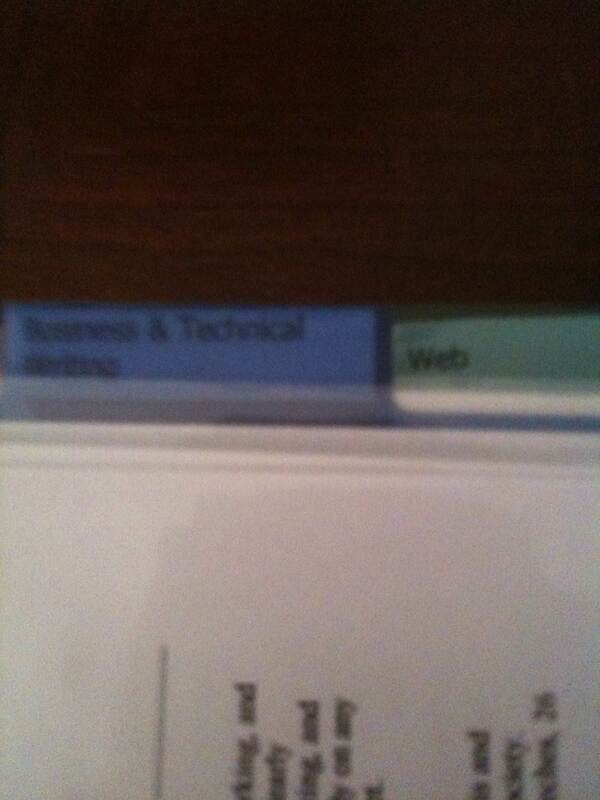 This entry was posted in job hunting, personal, Uncategorized. Bookmark the permalink.